New Neutrals: As the seasons change, you often see wintery blues and holiday reds. HGTV says neutrals are the hot trend that’s taking over for color and contrast. Without a color palette, you can really experiment with rich textures, fun shapes, and layering similar tones. Adding velvet pillows, fuzzy throws, and chunky knit blankets in creamy whites or toasted browns can warm up your living room or bedroom. Statement Lighting: Curling up with a great book and a cup of hot chocolate is so much better with a cozy ambiance. According to HGTV, adding floor lamps to any room not only adds warm and brightness, but also creates a visually pleasing focal point. Use Greenery: If you’re like us, you miss the lush greenery of summer. To get that summer feeling in your home, incorporate greenery into your home décor. Delicious smelling eucalyptus, easy-to-maintain succulents, or natural garlands from Country Living are a great way to make your home feel cozy. The greenery will add pops of color, remind you of warmer seasons, and purify the air in your home. Layer Up: No more chilly floors during the colder months! One of the season’s biggest trends and our favorite cozy décor idea is layering rugs. Besides adding a warm touch, layered rugs help highlight a specific area in a larger living space. To layer rugs like a pro, check out these tips from Martha Stewart! 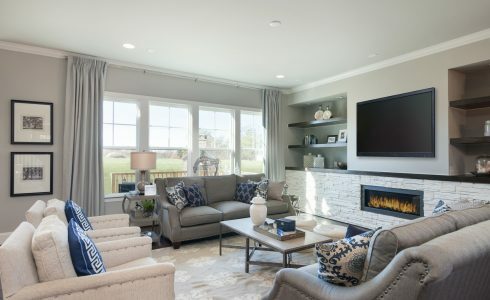 We believe it’s how you live that matters and love providing ideas that help you make the most of the colder temperatures and feel cozy in your beautiful home. Looking for more cozy décor inspiration? Check out the HHHunt Homes Pinterest page!